On Monday, I started the story of our family holiday, on which we celebrated Mum AND Dad’s 60th birthdays. Dad’s card was inspired by his love of red wine & the convenient fact that much of the holiday was spent visiting local wineries. The South West of WA is renowned for quality wines with Margaret River and surrounding suburbs having some of the richest & most fertile soil for grape growing. As part of their celebrations, Mum booked a limosine to take us on a very special wine tour. Travelling in style, we visited Wills Domain, Vasse Virgin, House of Cards, Gabriel Chocolate, Woody Nook, Aravina & Swooping Magpie to sample the local wares. It was a fabulous day out! 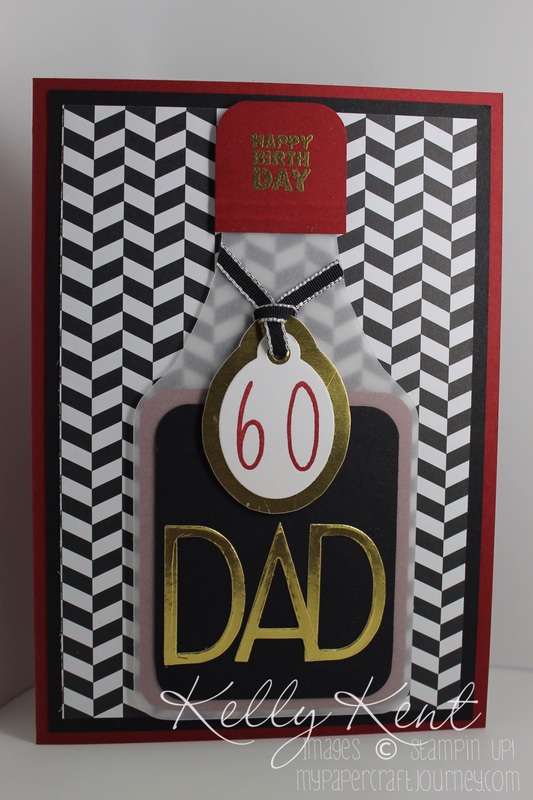 Anyway, back to Dad’s card ! The bottle was hand cut using the Envelope Punch Board to guide the corner rounding. I stuck with a classic red, white & black colour scheme with some gold to bling it out. After all, 60 is a pretty special milestone!